There is no real difference between gun dogs and hunting dogs - a gun dog is basically a type of hunting dog. The main difference is between the two is the type of hunting that they specialise in. Hunting dogs are skilled at hunting most kinds of prey while gun dogs are mostly used for hunting birds. For this reason, they are also known as bird dogs. Pointers - The English Pointer is one of the most well known examples of a pointer. Their skills lie mainly in seeking out game. Their name stems from the way that they point their nuzzle in the direction of game to signal to the hunters. Retrievers - The Golden Retriever is a famous example of this breed of gun dog. As their name suggests, they retrieve game that has been shot so that it returns to the hunter without being damaged. They are often more willing to carry game without damaging it than pointers and spaniels (who are sometimes used to retrieve). 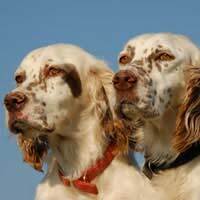 Setters - The English Setter is one of the most famous examples, but there are also Irish Setters. They are often used to hunt game birds like quail, pheasant and grouse. They are trained to pick up on the scent of prey, and commonly freeze once they find it. Their name comes from the distinctive "set" (crouch) that they perform once they've located the scent. Spaniels - The English Cocker Spaniel is a well-known example. They are used to assist hunters. Like retrievers, they can return game without damaging it. Although they mainly hunt game birds, they are also skilled at hunting rabbits and waterfowl. Water dogs- The Standard Poodle comes under this category. As their name indicates, they are trained to retrieve game from the water. Because of this, they are frequently used in waterfowl hunting. Water dogs are almost always strong swimmers. Some retrievers are also water dogs, and vice versa. Aside from gun dogs, there are several other types of hunting dog: hounds, terriers and curs. Hounds generally fall into three sub-categories. Sighthounds are so-called because of their acute visual skills. They see their prey from some way away, and pursue them quickly. They are fast and quiet, which makes for a deadly combination! Whippets are an example of a sighthound. Scenthounds are scent-orientated. They often hunt in packs, and guide hunters to their prey. Lurchers are a cross between a scenthound and a working dog breed. Terriers are almost always used to hunt other mammals. They seek out prey through their living environment and pounce. Many of their victims are common pests. For example, Fell Terriers are used to hunt badgers, but this is not always legal. Curs are similar to terriers, but often hunt larger game. They can often be a mixture of breeds. Gun dogs and other hunting dogs are used for a variety of hunting types. Different breeds have different skills and abilities, which make them ideally suited to a particular form of hunting.